Arnicare offers everyday pain relief where you need it most to temporarily relieve muscle aches and stiffness, swelling, and discoloration from bruises. Arnicare is available in a cream, a gel, an ointment, tablets, and pellets. The oral and topical forms can be used in conjunction to provide general and local relief. 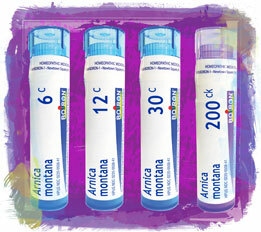 Arnicare Arthritis, Tablets, and Arnica pellets are easy to take and dissolve in your mouth. All oral forms of Arnicare are non-drowsy, and have no known drug interactions. Arnicare Cream, Gel, Ointment, and Bruise are unscented, paraben-free, and do not contain artificial colors or perfumes. Each topical contains only one active ingredient—Arnica montana, a homeopathic medicine that has been used for centuries as a natural pain reliever. Which Arnicare is Best for You? 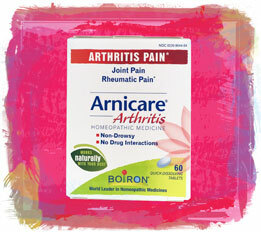 Arnicare Arthritis Tablets dissolve quickly, and temporarily relieve minor aches and pains associated with arthritis. Arnica montana pellets are convenient to carry, easy to use, and come in varying dilutions to provide general pain relief. 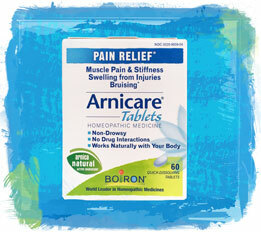 Arnicare Tablets offer general pain relief, dissolve quickly, and may be used in conjunction with an Arnicare topical. 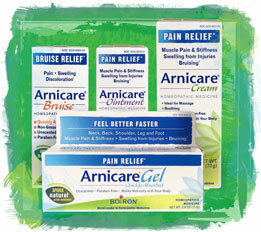 Arnicare topicals help relieve everyday muscle pain and stiffness due to minor injuries, overexertion, and falls.